Arielle Denise Dance is a doctoral student in the College of Integrative Medicine and Health Sciences at Saybrook University. Arielle has a master’s degree in women’s health. Diagnosed with endometriosis at 15 years old, Arielle has spent the majority of her academic career being an advocate in the women’s health community focusing on topics of chronic pain, disability, and marginalized communities. Arielle currently works for the American Cancer Society, but is extremely passionate about her work within the field of Integrative Medicine especially geared towards women’s health research. Upcoming research includes assisting women with endometriosis using specific relaxation techniques including meditation, deep breathing, and guided imagery. Arielle was honored to be the 2015 recipient of the Herbert Spiegel Scientific Poster Award for her poster titled The Utilization of Hypnosis, Hypnotherapy, and HypnoBirthing for Childbirth and Labor. This award is given to the best scientific poster on a hypnosis related topic, at the scientific poster session at the August residential conference of the Saybrook University College of Integrative Medicine and Health Sciences. Arielle initially conducted research on hypnotically-assisted birthing for the Saybrook University Basic Hypnosis course. Her poster was then presented at the 2015 Annual Meeting of the American Society of Clinical Hypnosis. Her literature review explores how hypnosis, hypnotherapy, and a specific technique called HypnoBirthing, have been used to reduce pain and anxiety, and improve birth outcomes in women for generations. Arielle is also a “doula,” a lay person serving as a companion and supporter assisting women before, during, and after the birthing process. 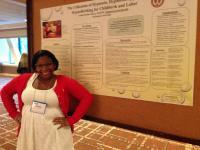 As a doula, Arielle has learned that by changing the language around birth, birth outcomes are more likely to improve. For example, she advises doulas and midwifes: “Instead of the word contraction, try using the words surge or wave; likewise, instead of pushing during labor, women can be taught to breathe down the baby.” Labor has the potential to be tranquil and not painful—hypnosis can play a major role in that.